Injured Goose Captured and Safe — Raptor Education Group, Inc. The injured goose at Fern Island Park in Wausau has been CAPTURED! She is on her way to the REGI clinic at this time. 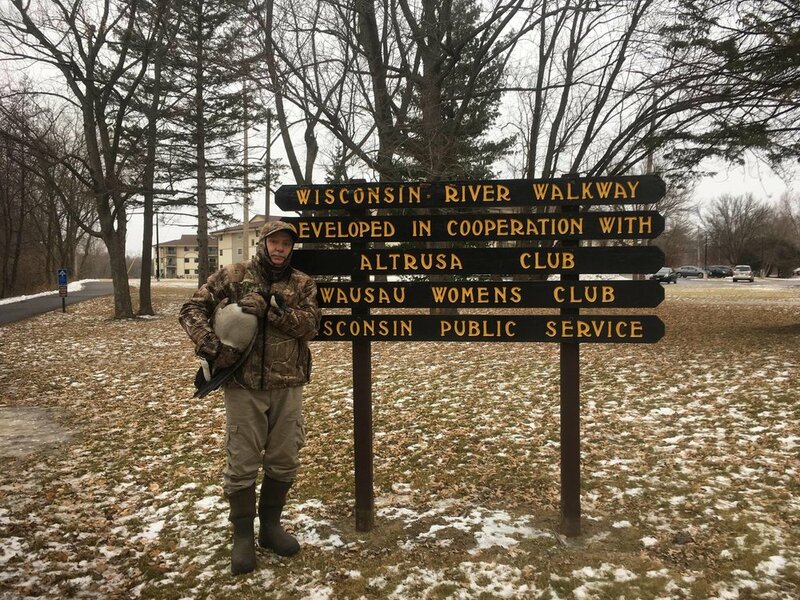 Kevin and Linda Grenzer are the heroes in this story and spent 5 full days and many man hours over the past several weeks developing various net traps and other methods in attempts to capture this very smart little lady goose. More heroes came in the form of many wonderful folks that worried about her, fed her, looked after her and kept us informed as to her whereabouts. More when she arrives and we can examine her. Thank you everyone for your help and concern. She is here, she is safe and she is well! We were worried that she would be thin or nutritionally stressed. We were delighted to find her well fed. She is a little nervous, which is to be expected as she has had to be on her game 100% of the time since she was injured and left alone when her flock had to continue migration without her. We are calling her Fern, in honor of Fern Island Park, where she survived for several weeks on her own, with the help of some wonderful Wausau friends. Thank you everyone. Kevin Grenzer with his miracle capture! Fern the Goose. The weather is getting colder and concern for the injured goose was growing. We were concerned for the goose but also for the public that were worried about her and were also trying to capture her on thin ice. Bravo Kevin and Linda Kevin Grenzer! Sweet girl with her heroes! Thanks guys. I sure appreciate your hours and hours of trying for this little lady.